Tigers 22 defeat Rabbitohs 6. It was a big milestone game for both teams, with ex Rabbitoh and returned king Robbie Farah celebrating his 250th game as a Tiger against his old club. Meanwhile South Sydney had club legend John Sutton celebrating his 300th game, which sees both players set a club record for most appearances. Both teams had something to play for with the Rabbitohs looking to hold onto top spot on the NRL ladder and win 10 straight games, while the Tigers are playing in a must win game to keep their finals hopes alive. It was the desperate Tigers who struck first when a flurry off attacking opportunities got them on the board through young gun Esan Marsters thanks to a stellar Luke Brooks short ball on the line. The Tigers were on fire and had all the momentum going their way both on offence and defence. After conceding multiple sets on their own line, the tigers defence held strong forcing the Rabbitohs in a frustrating style of football, and it only got worse when the Tigers were able to convert that into another try. A brilliant attacking set play aimed through the side of Esan Marsters saw the young gun stand up again when he drew in the Rabbitohs winger to pull off a brilliant flick pass to send David Nofoaluma over in the wing. Despite being down 10-0, Souths couldn't crack the Tigers defence, and one of their best first halves this season saw them keep the number one attacking team in the comp scoreless at half time. The opening 20 minutes of the second half saw a real arm wrestle battle between both teams. The Tigers blew an easy try early on and it was a real kick up the behind for the Rabbitohs. the 45th minutes all the way up to the 60th minute was an absolute bomb shell of attack by the Rabbitohs, however the Tigers defence held on strong to keep the Rabbitohs at bay for the meantime. Despite all the defence for the first 20 minutes of the second half, the Tigers miraculously scored first in the half to extend their lead out to 16-0. A great pressure kick by Luke Brooks got them the repeat set before he helped set up the scoring play when he found Michael Chee-Kam with another beautiful short ball and with new Tiger Moses Mbye lurking in support, he was able to grab the offload and go over under the posts. With the Bunnies in desperate need of a try, they worked hard to dominate the field position and get into a great attacking position, but once again the Tigers defence not only stood up again, but pulled off a counter with winger Corey Thompson picking off an Angus Crichton pass to race away down field for an 80 metre try and a miraculous 22-0 lead. Creeping into the final 10 minutes of the game, the Rabbitohs once again worked their way into a brilliant attacking position. Despite the result going their way, it came at a massive cost, with five players taken off for HIA check ups with only two players returning throughout the game. 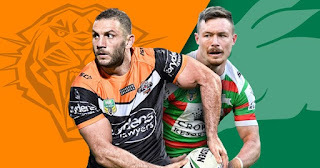 It finally took its toll on the defence when Cody Walker was able to force his way over the line in the remaining 5 minutes of the game to help the Rabbitohs for and against out which will prove the giant difference for top spot come the end of round 19. Once again the Tigers defence stood up, and it was the game defining effort that kept their finals hopes alive. The Tigers have now won a third milestone game by the opposition this year after Slater's and Bellamy's earlier in the year and put an end to the Rabbitohs win streak. The Rabbitohs now wait nervously for the results from the Dragons and Storm to determine wether they stay at the top of the table.